You can follow the expedition day by day en route to the South Pole by checking out our diary, which we will update as we go. You will also be able to see what Amundsen wrote in his own diary exactly 100 years earlier. Our expedition is now at an end after yet another busy day at the South Pole with Norwegian and international media. Public interest in the last few days has been overwhelming. Thank you for allowing us to follow in the long-gone tracks of your skis for these past few weeks. To feel for ourselves your experiences and hardships in the icy wasteland. We had to clench our teeth to manage 4 km/h where you flew forward at 7.5 km/h behind the dogs. But we sometimes took pleasure in the wind. All four members of the expedition are now gathered at the South Pole, 100 years to the day after Roald Amundsen's great achievement. Vegard Ulvang and Harald Dag Jølle completed the expedition on skis and reached the Pole at 11.30 am Norwegian time. Because of different time zones, we are ahead of the celebration in Norway. The first event was that Prime Minister Jens Stoltenberg skied the last few kilometres of Amundsen’s route in to the South Pole. After we had set up camp 80 km from the South Pole last night it became clear that time was too short and the kilometres too many for us to make it in time for the Jubilee festivities. To make it in time for the centenary celebration, the two were flown in the last 80 km to the Pole tonight. We're doing everything in our power to reach the South Pole by the fourteenth. We have two days and 80 kilometres to go. It ought to be doable. For the past few days our emotions have been on a roller-coaster along with our estimates of whether or not we will make it to the South Pole in time for the Jubilee 14 December. One moment we were in an optimistic mood; the next moment we were uncertain – to say the least. Today we passed the latitude of Shackleton’s farthest south record from January 1909. It would have been an excellent reason to stop and reflect, but today we have only two things on our minds: 14 December and the incredibly gritty snow. Fish glue is what Amundsen called the abrasive snow we have been fighting against all day. It’s almost like skiing in sand, and over ten full hours of active skiing resulted in a disappointing 27 km. We had almost given up. Amongst the team insinuations have been overheard to the effect that it was all a big bluff – a cheap publicity stunt by United Bakeries. The UB fiver was non-existent. New day, new opportunities. For the South Pole skier, only time will tell. Today provided a great example that Titan Dome, for all its 3200-m elevation, has more to offer than contrary winds and bitter cold. “You’ll be home for Christmas won’t you Daddy?” The six-year-old’s voice sounded a bit troubled, and the sentimental father at 87 degrees south felt tears sting his eyes when he talked to his daughter by satellite telephone. That’s the name Stein Tronstad from the Norwegian Polar Institute gave to the last map sheet, the one we are now using. At the moment, it’s difficult to see any charm. We have had yet another day of -30°C and strong headwinds. Those who have never skied to the South Pole might imagine it to be frightfully boring. That the same old things are repeated day after day. But that is a far cry from reality. It has been a brisk day with gales and -30°C. The snow gets rough when it drifts and our skis meet much more resistance. We have also been obliged to keep a close watch on our faces and hands today because of the strong wind. Suddenly it was there again last night. The sun. After nearly three days’ absence it was glorious seeing sunlight shining on the cloth of our tents. It makes all the difference. We most certainly agree with Amundsen that “the Butcher” is no inviting place. Two days in a tent. Cold, the air full of snow. We wanted to move on. This was supposed to be the day we started on the last 500 km to the South Pole. But the weather put a stop to that. During the night the wind picked up so much that it would have been foolhardy to set out on skis. The risk of frostbite was too great. It is a day of rest on the Plateau. This means the expedition’s official bloggers have the day off, and the task of reporting today’s news falls to the less serious team members. It isn’t possible to write today’s text without expressing our gratitude to Alse T. Johansen’s expedition. They struggled manfully up the slopes, leaving wonderful tracks behind them! An incredible two thirds of the world’s fresh water – water in the atmosphere, rivers, lakes, glaciers, and groundwater – is stored here in Antarctica. Today we have waded in deep powder snow, gaining 800 metres of elevation, through a spectacular frozen landscape. Glaciers tumble down between the mountains, making their way to the Ross Sea. We are impressed. How did the five men who were here in 1911 gain an understanding of the landscape so quickly? How did they know which path to choose? Where we are supposed to make our ascent, it looks as though the onward road ends abruptly in a vertical wall of rock. Words escape us. Even a seasoned adventurer falls silent when he looks around here. Modern-day superlatives like wicked cool, awesome, and insane spring to mind as our skis swish ever closer to the Axel Heiberg Glacier. They hadn’t had bare earth under their feet since leaving Madeira in 1910, but now Amundsen and Bjaaland were standing on a little hump of rock at over 85 degrees south. Amundsen named this hill Mount Betty after the nanny who had looked after him throughout his childhood. At lunchtime today we passed kilometre number 655. A bit more than the distance across Greenland. And we are still on the Ross Ice Shelf – this gargantuan floating glacier. Vegard’s children have inscribed a greeting on his bowl. It says “Choose to fight, Daddy!” Today we have all fought. After 19 straight days without a break we were sorely tempted. If only we hadn’t been so far behind Roald A. This is an adventure. It’s an incredible adventure. We’re tired and we’re cold, and we won’t pretend we rejoice every time our skipoles hit the snow. But the big picture is that we are both humbled and grateful to be experiencing these days. Yesterday we sighted land. That was South Victoria Land, in the southwest. Today we spotted more land. Tall mountains towering over the Ross Ice Shelf. A new era has begun for the centenary expedition. We have sighted land! Little white peaks were suddenly visible above the horizon in the southwest. Here we are in the middle of nowhere, communicating with the world every evening by e-mail and an Iridium satellite phone. Our blog posts take shape as we ski and we often use our breaks to try out ideas and get comments. Yesterday’s wind let up enough for us to continue and after a short stint of skiing we arrived at the depot. For the first time, the weather has stopped us. Halfway through what should have been our next-to-last stretch we were obliged to throw in the towel and admit that the wind had defeated us. On 11 April 1911 the last dogsled came to a halt at Framheim. For two months, Amundsen’s men had been moving provisions – seal meat, dog pemmican, biscuits, butter, chocolate, petroleum and a selection of gear – 3000 kilos in all. Darling body, please be nice, – And carry me across the ice. We are skiing on an endless expanse of ice. There are no landmarks to be seen. The Ross Ice Shelf floats on the ocean and is several hundred metres thick. It rises and falls with the tide, but that movement is undetectable to us. The temperature was 22°C when we woke up and noticeably more pleasant than the past few days. And then the wind veered to one side and we hoisted our sails. The flat expanse of the Ross Ice Shelf made it possible for Amundsen and his team to be towed on their skis behind the dogsleds. We trudge onward and search longingly for anything that might lend a helping hand. After one week sharing a tent with the same person, it’s time to switch partners. Until now, Stein and Harald Dag have shared one tent and Jan-Gunnar and Vegard have shared the other one. It has been another day of glorious sunshine. It was almost pleasant in the morning, but when the thermometer shows -25°C it doesn’t take much of a draught to make you feel wretched. And we had a bit of that towards the end of the day. We encourage ourselves out here on the ice by taking note of every new milestone. Today we had several reasons for celebration. How do you select the team for a centenary expedition to the South Pole? This project began with a phone call from Rolf Bae to Stein in the winter of 2008. Today we changed our strategy and are now skiing for 50 minutes at a stretch instead of 60 minutes. Covering this many kilometres requires discipline and we are trying to shorten our rest breaks. Ulvang is the slave driver. We have no competitors. And we keep telling ourselves we must run our own race and start gradually. We set out at 9 am with the sun at our backs and the wind in our faces. At last we are moving towards our goal! When approaching Antarctica by sea one is met by an inhospitable wall of ice several tens of metres high – the barrier. At long last we have arrived at the Bay of Whales. We flew for six hours with one stop to refuel, covering a distance roughly the length of Norway. We can’t leave Union Glacier without saying more about Ronny. He was the first person we met when we disembarked from the aircraft. We have now been given the go-ahead to depart for the Bay of Whales at 2 am Norwegian time. Travel time 7-8 hours. “The first night out is never particularly comfortable, but this one was awful.” That was Amundsen’s acerbic comment after the first night in a tent, and we echo the sentiment 100 years later. A sudden shift from a hotel bed to -35°C does not pass unnoticed. We landed at Union Glacier 15.45 Chilean time, which is 20.45 Norwegian time. Now we are waiting at the ALE base. They may fly us onwards tonight, but probably not until early tomorrow (Chilean time). The last thing we did before leaving Punta Arenas was to visit the cemetery and honour the memory of Adolf Amandus Andresen. “Capitan Adolpho Andresen” from Sandefjord is the unknown Norwegian who initiated commercial whaling in the Southern Ocean. He harpooned his first whale in the Strait of Magellan in 1903. Today at last the weather is on our side and the expedition team is being flown to Union Glacier on the Antarctic continent. The Englishman Mike Sharp has been transporting people to Antarctica since the mid-1970s. But in his opinion, Nansen is a greater hero than Amundsen. ALE, the logistics company that will transport us to Antarctica, are working as hard as they can to get us all south. The most recent weather forecasts show a possibility of flying on Friday. Many people want to go to the end of the Earth. Yesterday we saw the custom-made Toyota that will set a speed record in January. 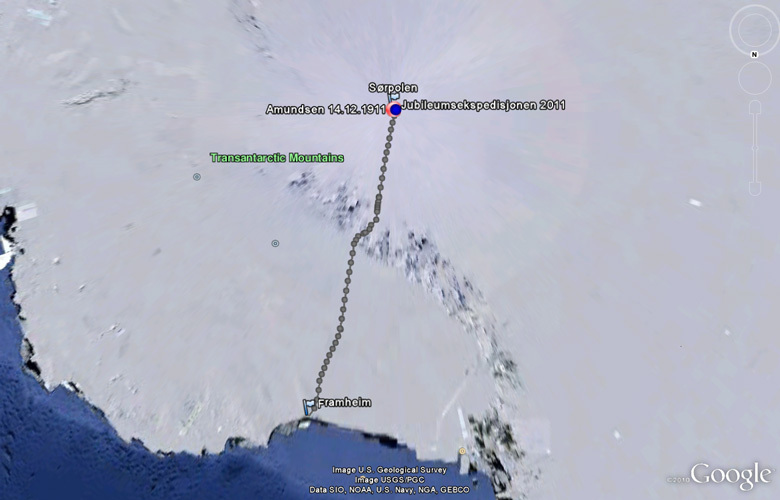 Traversing the distance between Union Glacier and the South Pole (around 1000 kilometres) in 24 hours is a possibility. There’s no denying that it’s frustrating to sit here day after day. We can see how Amundsen’s red circles light up on his southward course on our home page. Today it is one week since our aircraft was supposed to take off towards the south. We still don’t know how long we will be stuck in Punta Arenas. Yesterday we killed some time with a cup of coffee at Bar Shackleton. As the days pass and the delay grows longer, more and more expeditions are accumulating in Punta Arenas. Yesterday we had a visit from “The Scott-Amundsen Centenary Race 2011-12”, a British expedition that is recreating Scott and Amundsen's race to the South Pole. We were totally convinced that today would be the day, but once again we had discouraging news. Everything remains uncertain, but now they are talking about Monday as the next possible opportunity. Yesterday we called on the Chilean Antarctic Institute. Our visit was both pleasant and useful: we were shown around and given a thorough introduction to their research. They are interested in many of the same issues as we are. We are receiving a few questions about how we pass our time while we are waiting. What on earth do you talk about when you are expected to arrive at the South Pole on 14 December and must ski 1,300 km to get there, and have to ski faster and faster for each day’s delay? Today we were supposed to have put on our skis, but we are still 4,500 kilometres from Bay of Whales. Our skis have been subjected to intensive treatment in preparation for when we put them on in Hvalbukta, and they have been waxed as if Petter Northug were about start an olympic 50 km race in cold conditions. Early this morning they had finally cleared the runway at Union Glacier. They’ve been working hard both day and night down there. But they didn’t finish in time to beat the approaching low pressure zone. It looks as though we will start on our way tomorrow, Tuesday – and while we wait for the final go-ahead, we might as well have another meal. Our departure has been postponed. It is taking a long time to remove the hard-packed snow from the runway on Union Glacier. Take-off will not be until tomorrow at the earliest, almost exactly 100 years after Roald Amundsen set off from Hvalbukta. It’s hard to tell whether Roald Amundsen would have been horrified or delighted, proud or embarrassed if he could see what’s happening along the route his sleds followed in the autumn of 1911. Is he turning in his watery grave or chuckling behind his beard? Maybe he is wondering what point there can possibly be in repeating a feat he had already accomplished a hundred years ago. Ilyushin il-76 was the Soviet Union’s version of Lockheed’s C-130 Hercules, but was considerably larger. The Soviet Air Force started using the plane in June 1974 and il-76 became the main strategic air-freighter east of the Iron Curtain. Our last weeks before leaving Norway were hectic. Book release, celebration of Nansen’s birthday, preparation at work and at home. The expedition team has arrived in Punta Arenas in Chile and final preparations are being made. Soon the first flight of the season will take off bound for the landing strip on Union Glacier in Antarctica. Everyone is pretty tired after a number of hectic days – or weeks. Isn’t it strange, how much always remains to be done at the last minute? In addition, we all had roles to play in yesterday’s celebration of Nansen’s 150th birthday.